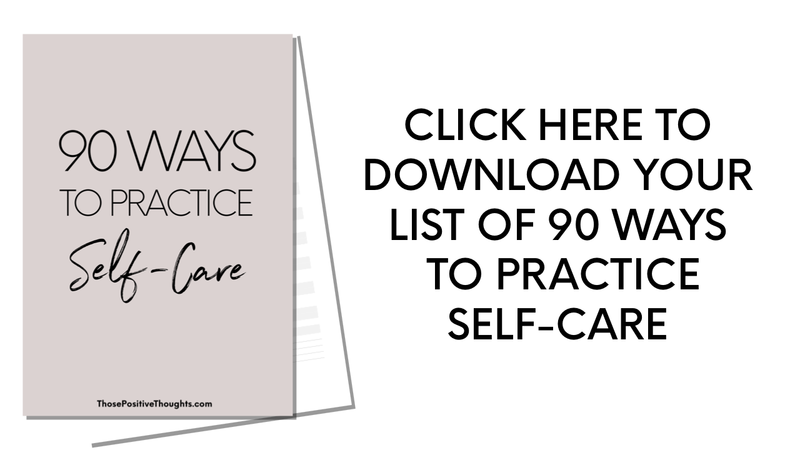 In this post I’m sharing 90 self care ideas to reduce stress. Self care is the actions and practices in which we engage with to enhance and protect our health and well-being. Self care is about finding something which you can carry out on a regular basis to reduce stress and help you relax and unwind from the daily pressures of life. There are countless ways to introduce self care into your life which can be looked at through the five different dimensions of self-care. The five dimensions of self care include physical, emotional, mental spiritual and social. By introducing self care ideas from each dimension you will be nourishing every aspect of your life. Let’s take a closer look into these five aspects of self care and examples of each one. Physical self care is simply anything related to your body. Do you exercise regularly? Are you getting enough sleep? Are you eating enough nourishing and healthy food? How do your muscles feel, do you need to stretch or have a massage? How about our wardrobe, are you wearing clothes which make you feel confident and comfortable? Relax in a spa and book a treatment or two! Emotional self care is being aware of and nurturing your feelings. How does your schedule look, are you taking on too much work? Do you spend too much time around negative influences? When was the last time you did something you loved? Mental self care is finding something which encourages intellectual and creative stimulation. The activities resemble those which we did as children, such as drawing, writing and designing. How much do you use your imagination? Are you depriving your inner child from such activities? Spiritual self care is your relationship and recognition with something much bigger than yourself. Generally it’s thought to be the same as religious and spiritual beliefs yet this is just one way of practising and expressing spiritual self care. Social self care is your engagement with other people. Everyone needs social interaction, no matter how much of an introvert you are. It’s about finding the amount of connection which is right for you. Do you feel bad for not seeing your friends more often? Do you crave some quality time with a relative? What are your favourite self-care ideas? Comment below! Spending time with the one’s I love is something I often neglect but is so so so important. I love this. I need to do more of this, and as a working mom, a lot of times we push ourselves aside in favor of our families. It’s so important to take care of ourselves, because that means that we will be our best. I need to take a lot of these to heart and make sure I do these. I would love if you read my current blog post about my self-care ideas and how I get motivated. I LOVE that you broke these self-care ideas into categories! It makes it super helpful in hitting all areas of self-care. I’m definitely lacking in the physical self-care department, so your ideas are a big help! Thank you! These are so great and I love how you split it up into different categories. I actually got an adult coloring book for a gift and still have not used it.